I recently visited Chase Hill Farm in the beautiful hills of Warwick MA to congratulate Ben and Laura Wells-Tolley on the transfer of farmland. Stepping onto the farm in my wellies, I couldn’t wait to meet the cows. As Ben introduced me to Maggie (short for Magnolia), Grace, and Izzy, and her calf, Apple, I learned they have 40 animals on the farm. Working other farms for nearly 10 years, Ben and Laura always knew their future dream farm was going to have a dairy herd as its centerpiece. Finding the right piece of land was their biggest challenge and took them years. They were leasing farmland but struggled in their search for a farm of their own. 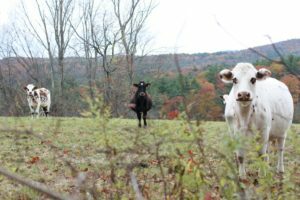 New England has some of the steepest farmland prices in the country. Competition is fierce for prime farmland close to markets. And land is constantly at risk of being developed. With farmer-field agents on the ground throughout New England, we work with and counsel experienced farmers on personalized transfer plans and help incoming farmers find land. Mark and Jeannette Fellows previously owned and operated Chase Hill Farm for 33 years. When they began wrestling with planning for their retirement while still wanting to keep their land in farming, they reached out to Land For Good. 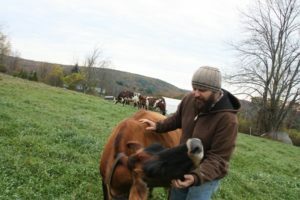 We are in our mid-50s, and it was just getting really hard to do the work, but leaving the farm behind is difficult emotionally,” shared Mark. The Fellows are not alone. 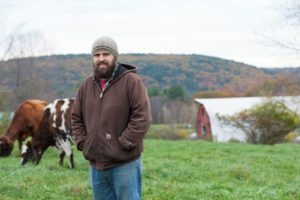 One-third of the farms in New England are owned by farmers at or beyond retirement age. 90% of them currently do not have a young farm operator learning and working beside them. In truth, aging farmers face uncertainty about the future of their farms because many lack a ready successor. Meanwhile, beginning farmers struggle to gain access to the land they need to start and grow their agricultural businesses. A new generation of farmers exists, but they face obstacles as well. Land For Good stepped in at a crucial moment for Chase Hill Farm by helping the Fellows with their transfer planning. They realized the immediate need for identifying a successor. And rather than wait 10 years and have to sell hastily, they found Ben and Laura who share the same values. Ben and Laura also share the Fellows’ passion. 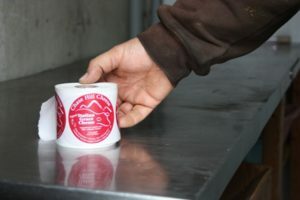 Chase Hill Farm is known for their tradition of organic farming methods and handmade cheeses. The farm will survive and flourish—strengthening the farmland security of the community—thanks to timely intervention. 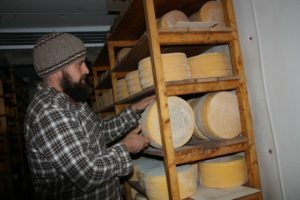 Ben and Laura had stopped making cheese for the season when I visited the farm but offered a tour of their “cheese cave” which holds a year’s worth of cheese, and it was chock full of their handmade varieties; like their Holey Cow Cheese, Italian Grace Cheese, and others. It’s wonderful to know a tradition continues.